MAXIMUM FINES RECOVERY- mclanahan.com IT TAKES MORE THAN A PIECE OF EQUIPMENT With a McLanahan Ultra Fines Recovery System you can keep 30,000 tons or more from going to the pond, giving you more usable product. 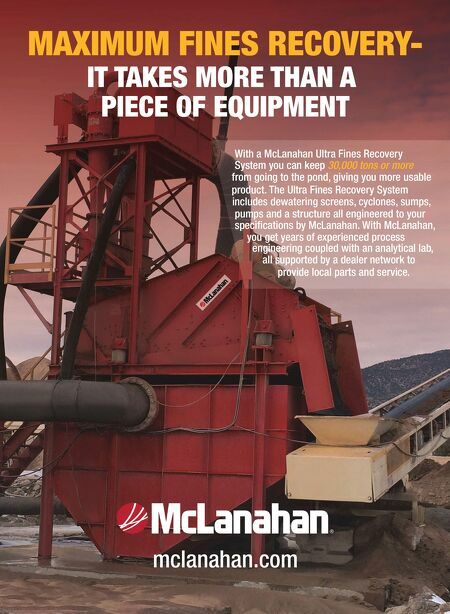 The Ultra Fines Recovery System includes dewatering screens, cyclones, sumps, pumps and a structure all engineered to your specifications by McLanahan. With McLanahan, you get years of experienced process engineering coupled with an analytical lab, all supported by a dealer network to provide local parts and service.